The second project completed while passing the winter in South Carolina, is the above quilt, inspired by the shaker tune, “Simple Gifts”, as well as by the fabric seen below. 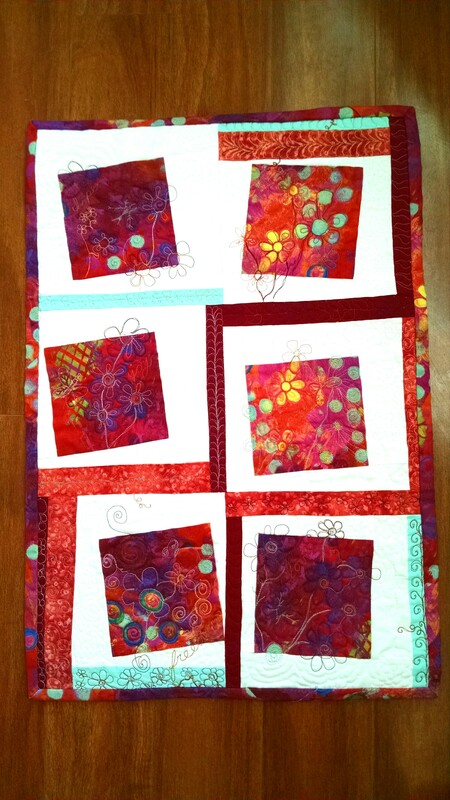 The quilt top was pieced very randomly, to demonstrate the concepts of freedom and joyfulness, using this fabric with coordinating solids. I chose to call it “Simple Gifts from the Valley of Delight”. 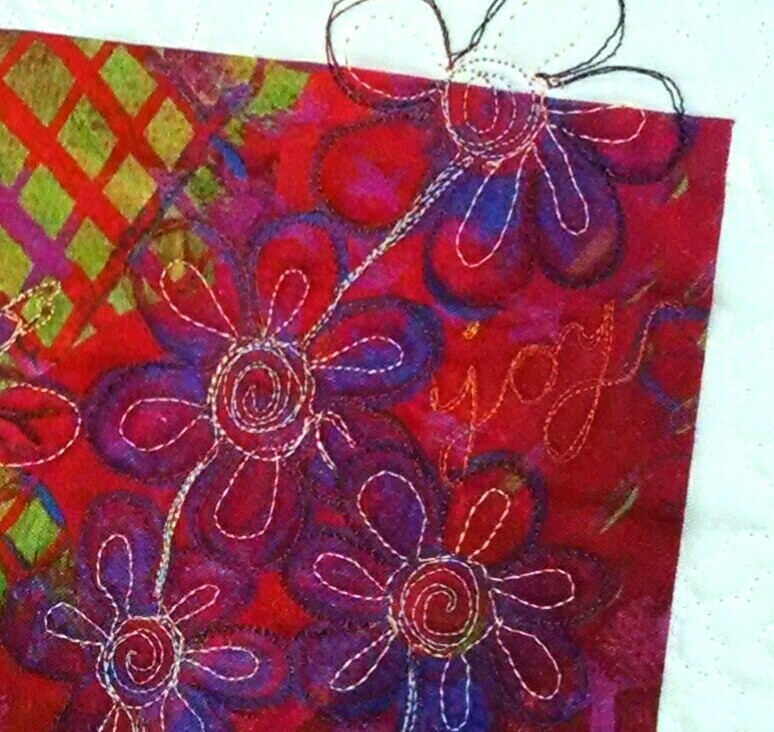 After completing the top, some machine embroidery was added, to delineate fantasy flowers, and to add a different “gift” word to each of the print squares. I wished the appearance of the words to be subtle, so that the viewer would have to seek them out, much as in life, we need to be watching for the presence of these gifts in order to recognize them when they occur. Below is a close-up of one of the squares, that shows the word “joy”. Finally, the quilt sandwich was built, and I had the pleasure of adding the free-motion quilting, This was a fun quilt, Put together in recognition of the generosity of a brand new friend, who seems to always put the needs of others before her own, and who told me to use whatever colors inspired me, as there is no color which would not be welcome in her home. This is beautiful! 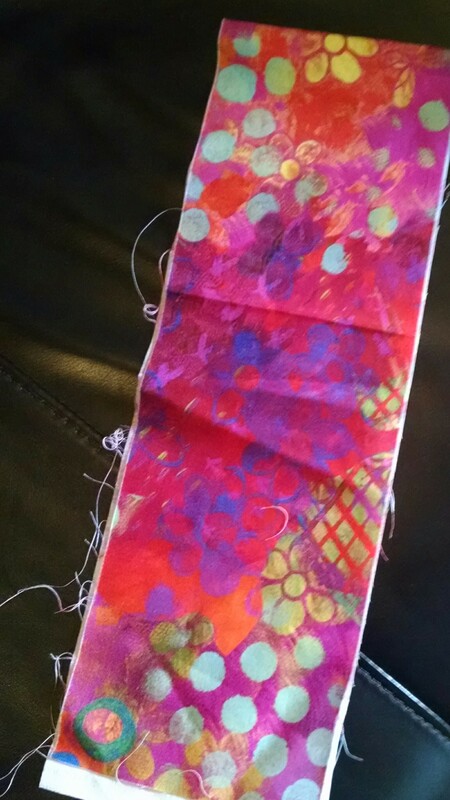 I’m going to use your idea of having a song inspire a wall hanging. What a great idea! Thanks for the feedback. I so enjoy your posts.